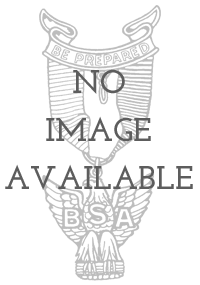 Eagle Medals are classified by the manufacturer who produced the medals. In order from oldest to newest, these companies are: T.H. Foley (1912-1915), Dieges and Clust (1916-1919), Robbins (1920-1978), Stange (1968-1999), CFJ (1999-present). The rarest and most valuable Eagle Awards will be those made by Foley and Dieges & Clust, though some of the early Robbins Eagles can be valuable as well. 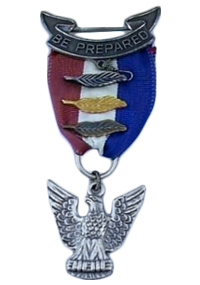 Later Eagle awards tend to be more common and so collectors do not have to pay as much to acquire them. Listed below are the manufacturers and how to identify their Eagle awards. Identification: The Foley Eagle can be identified by several unique features. Foley Eagle Awards have a hallmark on the back side of the Scroll that the ribbon is attached to, often you need to pull back the ribbon a little to see the full hallmark. It should read “B.S. of A. Pat. 1911 T.H. Foley, N.Y.” or sometimes it will be “B.S.A., T.H. Foley, 1 Madison Ave, NY“. Other features that can identify a Foley are that the ring on the Eagle’s head will be perpendicular to the ribbon, later Eagles will have parallel rings. There are other distinguishing features that are less obvious, but if you have the hallmark or a perpendicular ring, there’s a good chance it’s a Foley and worth a lot. 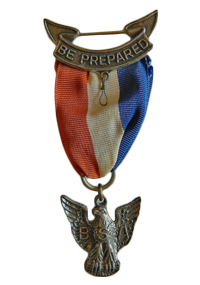 Value: From 1912-1915 only 338 Scouts were awarded the Eagle award and it’s likely many of those have been lost over time. This makes the Foley Eagle extremely rare and very desirable to the point that only very advanced collectors have them in collections in most cases. The T.H. Foley Eagle is very valuable, especially if it is in good condition. However, even awards that are found with damage from age or time can be very valuable. Please contact us if you think you have Foley Eagle and would like assistance authenticating it. Identification: Identifying the Dieges & Clust Eagle Award Medal is most easily done by checking for a hallmark on the back of the scroll, usually you’ll have to move the ribbon out of the way to see the mark. The Dieges and Clust mark reads “Dieges & Clust Sterling” where Dieges & Clust is in an arc over Sterling. Some Dieges and Clust Eagle Medals do not have a hallmark and to identify one without a hallmark you will have to compare features to a known example. We have many resources and are happy to help so don’t hesitate to Contact Us. 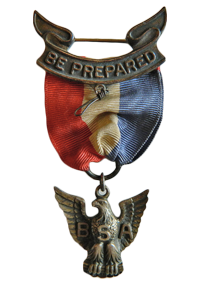 Value: Scout records indicate that only around 1,400 to 1,500 Eagles were awarded from 1916-1919 and as with anything that old, many of them did not make it to today. Many are still being found, but the Dieges and Clust Eagle is still quite rare and desirable for collectors. As with anything rare and desirable, these medals are very valuable. Please contact us for current pricing as values for high end items like this can vary quite a bit over time. 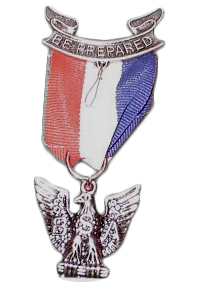 The Robbins Company produced Eagle Awards for by far the longest period of time and during that time there were 5 significantly different Eagle Award Types produced, and many subtypes of those. For the purposes of this guide we will only discuss the main types and if you need help determining a subtype, please contact us for help and more information. 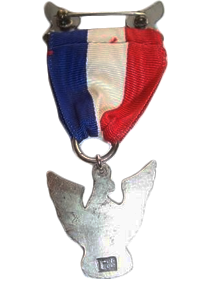 Robbins did not have a specialty hallmark but most Robbins Eagle Awards have “STERLING” stamped on the back of the scroll. 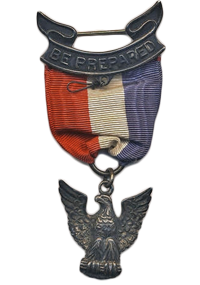 Robbins Eagle Awards also have a much shorter and simpler knot hanging from the scroll than the double knot found on the Foley and Dieges & Clust Medals. Identification: The Robbins Type 0 is a recent discovery that hadn’t been truly accepted as a new type by collectors until enough had surfaced in collections. 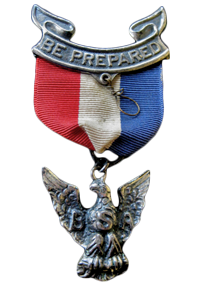 The Robbins Type 0 has a short single knot that many collectors refer to as a “noose”, which can be found on all Robbins medals. The main feature identifying a Type 0 from other Robbins medals is that the loop on the Eagle’s head is attached behind the head, so from behind it you can see the bottom of the loop attached to the back of the Eagle’s head, rather than the top of it. The Robbins Type 0 also has a larger clasp than would be found on most other Robbins Eagles. It can be difficult to distinguish between the different types of Robbins medals to anyone who isn’t an advanced collector or experienced at looking at the small features of the medal, and the consequences can be huge. The difference in a Robbins Type 0 and Type 1 would be thousands of dollars, all over where a loop is located! Please feel free to contact us for help determining the type and value of your items. Value: The Robbins Type 0 is extremely rare and many collectors are scrambling to try and locate them, this has driven the value to very high levels and since the medal was only produced for a single year there aren’t many out there. If you think you have a Robbins Type 0 then please contact us for an appraisal. Identification: The Robbins Type 1 is the medal that starts to separate advanced collectors from intermediate ones. They can be identified by an increased level of detail in the back of the Eagle, but the features of the Eagle are overall less detailed than in later Robbins Eagles. 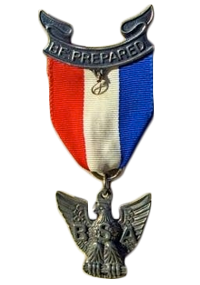 The Type 1 medal has the “noose” style shorter knot and the “STERLING” mark in the back of the scroll. There are many small details that distinguish the subtypes of Type 1 such as open or closed beak, the type of ribbon, clasp type, Eagle size, and tail notch. Identifying the proper type of Eagle you have is important but really too in-depth for full detail here, please contact us with pictures of your particular Eagle award and we’ll be happy to help identify it properly for you. Value: The Robbins Type 1 subtypes are all rated as scarce to rare with the order from rarest to scarce being: Type 1b (rarest), Type 1a, Type 1c, Type 1d (scarce). The reason Type 1b is actually the rarest is because it was only produced for 1 year, while the others were made for multiple years worth of runs. For a dedicated collector it isn’t too much trouble to find an example of each type for their collection but finding Medals in good condition with the original presentation boxes can be harder and more expensive. Each of these medals will cost over $100 for lower end examples, with those in good condition and a rare version going for a few hundred. Note: Shown at left is the Robbins Type 1b, which has a closed beak, and smaller Eagle than the other Type 1s. Identification: The Robbins Type 2 can be identified by the style of the Eagle as it is much more detailed and crisp than any of the earlier Eagle emblems. The differentiation between the 2a and 2b is based on the design of the back of the Eagle. The 2a has a back that comes to a point towards the tail feathers, while the 2b has a smoother back that transitions into the tail. For help identifying the type of your Eagle, please contact us with pictures. Value: There is a distinct difference in value between the Robbins 2a and Robbins 2b, the Type 2a was only produced for a short time in 1930 before the back was redesigned as the Type 2b. For this reason it is very rare and valuable, while the 2b is still scarce and hard to find, but is more common and less valuable than the Robbins Type 2a. Note: Shown at left is the Robbins Type 2a, which shows the extra level of detail and features compared to earlier, and even later Eagle Emblems. 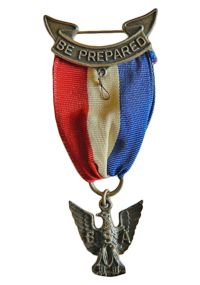 Identification: The Robbins Type 3 is the award that had the longest lifespan out of all the versions of the Eagle award, it was produced for over 20 years with the only real changes occurring in the type of ribbon used. For collecting purposes, most people do not distinguish any Type 3 subtypes. 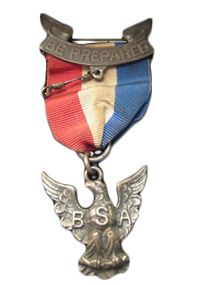 This is the first Eagle award that has no “BSA” on the Eagle’s chest, but it still has the same detailed back found in the Robbins Type 2b. Value: The Robbins Type 3 is quite common, owing to its long production during the heyday of Scouting from the 30’s into the 50’s. You can frequently find Type 3s for less than $75. Identification: The Robbins Type 4 is distinguished by again having no “BSA” on the chest, but it also has a flat back on the Eagle, typically with a hallmark. There are different hallmarks you might see, and some people collect different ones. 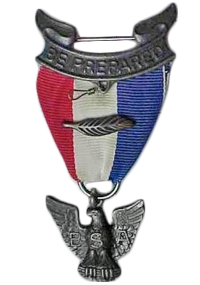 Some Robbins Type 4 awards will have the Scout’s name or other information engraved into the back of the Eagle as well. Value: The Robbins Type 4 is again, a common type that you can find pretty easily on eBay or at Trade-O-Rees. The Scouts who earned a Robbins Type 4 are in their 60s or 70s now so more are coming to market as their children sell off their collections. Identification: The Robbins Type 5 brought back the “BSA” on the Eagle’s front, and a feathered and detailed back instead of the flat back from Type 4. The Robbins Type 5 will also have a hallmark along the Eagle’s tail feathers on the back side, with an “r” and “STER” marks. Value: Robbins Type 5 medals are fairly common and are not especially valuable. The Stange Company produced Eagle Awards for 31 years and during that time there were 6 significantly different Eagle Award Types produced, and with some having subtypes. For the purposes of this guide we will only discuss the main types and if you need help determining a subtype, please contact us for help and more information. Stange was initially contracted in 1968, and Robbins was still producing until 1978, so there is overlap between later Robbins and early Stange Types. Identification: The Stange Type 1 is very similar to the Robbins Type 4 and they are often confused for each other. These two styles were produced at the same time from 1968 to 1969 so they are roughly contemporary. The Stange Type 1 has a flat back and no “BSA” on the Eagle’s chest. The easiest way to distinguish the Stange Type 1 is look at the back of the Eagle. There should be a hallmark with a script “S” in a box and “STERLING” in small lettering below it. Value: The Stange Type 1 is the rarest of the Stange made Eagles and there is solid demand from collectors looking for them. Identification: The Stange Type 2 can be identified most easily by the “S” and “STER” or “STERLING” Hallmarks that can be found as raised or stamped letters on the back of the scroll. The Stange Type 2 reverts to the more traditional Eagle design found before the Stange 1 with a “BSA” on the Eagle’s chest and a feathered back instead of flat. The Stange Type 2 medals were cast in molds rather than die stamped so you can often see small extra bits of metal that weren’t ground off properly. Value: The Stange Type 2 is fairly common and will not be especially valuable. Identification: The Stange Type 3 is one of the most recognizable designs because it is such a departure from earlier designs. It is often referred to as a “Gooseneck” because of the narrow neck and newer more angular look to the Eagle. It is stamped with the Stange “S” hallmark on the back of the Scroll, and “STERLING” on the tailfeathers of the Eagle. Value: The Stange Type 3 is fairly common and available to those who are looking for them. Identification: The Stange Type 4 represents the first time that Stange was the sole producer of the Eagle Award as Robbins had stopped by 1978. The Type 4 is identifiable by the while edging on the ribbon, it has the Stange “S” hallmark on the back of the Scroll and “STER” stamped in the tailfeathers. The Type 4 was produced by a die strike instead of being cast or molded like the Type 2 and 3. Value: The Stange Type 4 is pretty common and not too hard to find for a entry to intermediate collector. Identification: The Stange Type 5 Eagle has a white edged ribbon for 5a-5c, and no edging on 5d and 5e. There are small differences in the Eagle emblem that diferentiate the subtypes of Type 5, but in general Type 5s have a flatter, but still detailed back compared to older Eagles. Stange Type 5 Eagles are the first time that the emblem was not Sterling Silver, instead they are silver plated onto a copper base. 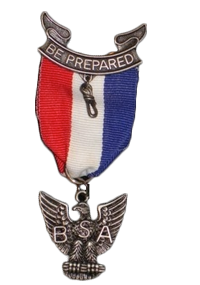 A scout could request a Sterling Eagle from the National Office at extra expense so they can be found with some minor variations in Sterling as well. Value: Stange Type 5 medals are generally common, but Stange Type 5e is actually a bit of a rarity that is not found very often. Identification: The Stange Type 6 Eagle premiered a newly styled Eagle produced in pewter. The Eagle of the Type 6 is significantly larger than those of previous types. The two subtypes of differentiated by the type of pin on them, the 6a has a pin and clasp, while the 6b has two post pins with clutches. Value: Stange Type 6 medals are both pretty common and easy to find. 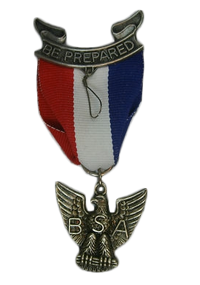 In 1999, the Custom Fine Jewelry Company (abbreviated CFJ) won a contract with the BSA to produce the Eagle Award. Identification: The CFJ badges are most easily identified by the large “CFJ” stamped into the tail of the Eagle, it’s large and hard to miss. The CFJ Eagles all have a two post pins with clutch attachments. The Type 1 introduced the first CFJ style Eagle, which is smaller than the Type 2, the Type 1 also a more “antique” style finish compared to the Type 2. Value: The CFJ Type 1 is the most difficult of the CFJ types to find, but it is available for a determined collector. Identification: The CFJ Type 2 has a larger pendant than the CFJ 1 and a cleaner more polished look to the metal compared to the CFJ Type 1. Value: The CFJ Type 2 is fairly common and will not be especially valuable. Identification: The CFJ Type 3 is distinguished from the earlier types most easily by the knot hanging from the Scroll. Instead of being a knot tied from wire like earlier versions, it is a cast knot that is larger and more substantial. Value: The CFJ Type 3 is fairly common and available to those who are looking for them.